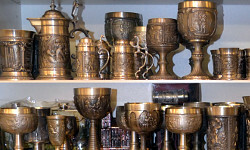 Is it always difficult for you to find the right souvenir or small souvenir for yourself or your loved ones? 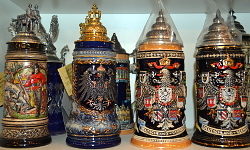 In our large assortment of typical German or Duesseldorf souvenirs we have certainly also a gift for your taste. Take a look at our small souvenir shop in Duesseldorf city center. What about a figural nutcracker or a printed textiles for a souvenir. Souvenir spoons and tableware, printed textiles, black forest cuckoo clocks, original beer steins. Take a look at our nice little souvenir shop in the center of Duesseldorf. Are you on holiday, business or weekend trip and you are looking for the suitable gift? In our shop, we offer you a great selection of current trend articles and gift ideas, vases from glass and plates, magnet figures, beer jugsy. 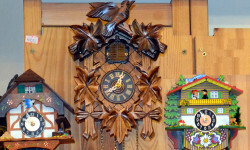 Colorful greeting cards, collector plates, souvenir spoons and tableware, printed textiles, black forest cuckoo clocks, figural nutcrackers, original beer steins, "Made in Germany" or other small gift items. We surely have a present to your taste. Take a look at our nice little souvenir shop in the center of Duesseldorf, you will definitely not be disappointed.